All ancient cultures link humanity’s origins to the heavens. The Egyptians, for example, were adamant that their ancestors came from the stars of Orion and Sirius. Today, however, religion and science assert that life arose spontaneously here on Earth. Did the ancients know our true cosmic origins? Have they left us clues? Expanding on the panspermia theory developed with the celebrated astronomer Sir Fred Hoyle—namely that the building blocks of life were imported to Earth by comets in the distant past—Chandra Wickramasinghe and Robert Bauval explore the latest findings in support of a cosmic origin for humanity. They detail the astrobiological discoveries of organic molecules deep in space, how microbes are incredibly resistant to the harshest conditions of space—enabling the transfer of genes from one star system to another, and the recent recovery of microorganisms from comets still in space. They argue that the universe was “born” and preset with the blueprint of life and that the cosmos must be teeming with lifeforms far older and perhaps far more developed than us. They show how life arrived on our planet in the form of interstellar dust containing alien bacteria approximately 3.8 billion years ago and how later comets, meteoroids, and asteroids brought new bacterial and viral genetic material, which was vital for evolution. Using the latest advances in physics, cosmology, and neuroscience, the authors explore how universal knowledge may be stored in human DNA and cells, and they postulate that ancient cultures, such as the pyramid builders of Egypt and the temple builders of India, may have known a way to retrieve this knowledge. 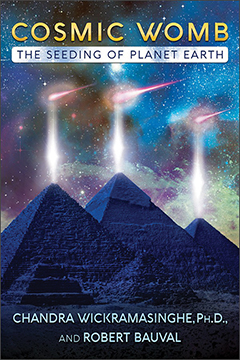 Sharing new discoveries from experienced architects, engineers, and mathematicians, they show how the Great Pyramid is a three-dimensional mathematical equation in stone, bearing a potent message for humanity across time and space about who we are and where we come from. Includes an 8-page color insert. COSMIC WOMB: The Seeding of Planet Earth By Chandra Wickramasinghe, Ph.D. and Robert Bauval. 408 Pages. 6x9 Paperback. Illustrated.